The Rough Rider Paratrooper knife, a replica of John Ek’s famous, yet little known, Model 8 knife. One of the rarer knives of WWII is the John Ek Model 8 Paratrooper knife. John Ek began producing knives for the war effort at the beginning of World War II. He made American fighting knives for American fighting men. Ek made every effort to ensure the fighting knives he made were going to fighting men who needed them. He insisted that all knives went to men serving actively in the armed forces. Besides attempting to make sure his combat knives would indeed see combat, Ek also hired persons who were physically disabled to make the knives. He began this practice in 1941, hiring 40 people with physical disabilities to make his combat knives and he continued the practice until his death in 1967. Ek also had a gift for promotion. Among two of his more successful sales tricks was receiving permission to legally sell his many of his knives as “Commando” knives from the British government and naming his Model 8 fighting knife the “Paratrooper. “ (The Model six became the “Patton” knife upon discovering it was the preferred knife of General Patton and members of his staff.) Ek knives were sold in the PX, from his factory through direct orders and also through authorized civilian dealers and as such were not mass produced through a major Government contract. However, in order to be sold in the PX and approved for production the knives had to get a Government stamp of approval. Each knife was serial numbered and in order to get the knife, you needed to fill out a form which asked for name, rank, service number, branch of service, etc. The knives were guaranteed for life. The originals were made with Nickel-Chrome-Molybdenum Steel, most likely 4340 which offered toughness and a certain amount of rust resistance. 4340 steel was used in aircraft manufacturing and as such was a war production scarcity. The fact that the Government allowed EK to continue to use the steel in his knife was a testament to the quality of the knives. Instead of the compressed leather washers, Ek used maple wood handles held to the full tang with the three lead filled rivets. The lead rivets could be pounded back into the handle if it became loose and Ek felt the wood handles would resist rot better than the leather. The knives were also shipped with sandpaper so that the soldier could add finishing touches to the grip and get it to fit his hand as he desired and not what some person in the factory felt was the best grip. The leather sheaths were very crude affairs held together with rivets and leather lacing and were often replaced by better made sheaths. Today, these sheaths would have never been considered jump certified as they had no tie downs whatsoever. However, Ek‘s philosophy was to make it as easy as possible to get the knife out of the sheath and in to action. This is why most of his knives had no cross bars and sheaths rarely had a tie down or snap to hold the knife in place. Ek main concern was that a knife could be brought into action quickly and felt cross bars and tie downs could lead to the knife snagging on something at the most critical moment. Original Ek Model 8 valued at $1,000. The original sold for $20! The handles were often reshaped after leaving the factory. The sheath was often described as crude. While the knives are very scarce, the sheaths are even rarer. The sheaths did not hold up well under combat conditions. Note large leaded rivets in the handle. The sheath is completely wrong and the handle has smaller rivets. The handle shape is different than in the example but the handles varied form knife to knife. The original was not delivered with a lanyard hole. The bottom edge grind does not go as close to the the hilt as the example above. The blade length on the Paratrooper was around 9 inches. The Upswept clip design would have made it great for chopping and slashing but not so hot in the poking department. The lead filled wood handle helped balance the giant blade and made it handy for bashing brains and such. If nothing else, the original EK Paratrooper looked fearsome and intimidating and could probably come in handy cutting through a French hedgerow. I’m sure it proved a valuable tool for the American paratroops that were lucky enough to get one. Some sources claim that Ek made close to 300,000 knives during WWII but according to Mark Silvey, a more realistic estimate is a 1/10 that amount or around 30,000 of all models. The Model 8 Paratrooper was one of his most expensive models costing around $20. Probably less than the 7,000 were made and as Ek made every effort to ensure they went to combat soldiers, few remained in mint condition. Today Model 8 knives in good to excellent condition sell for over a $1,000. After the War, EK continued to make knives under the name “Ek Commando Knife Company” He would make knives for service members during the Korean War and still later the Vietnam War. The company was passed on to his son when he died then sold to another concern before partially being bought by Blackjack knives. When Blackjack went bankrupt, some former Ek employees bought the company and once again began making knives for military forces. So much for the background on this little known knife. 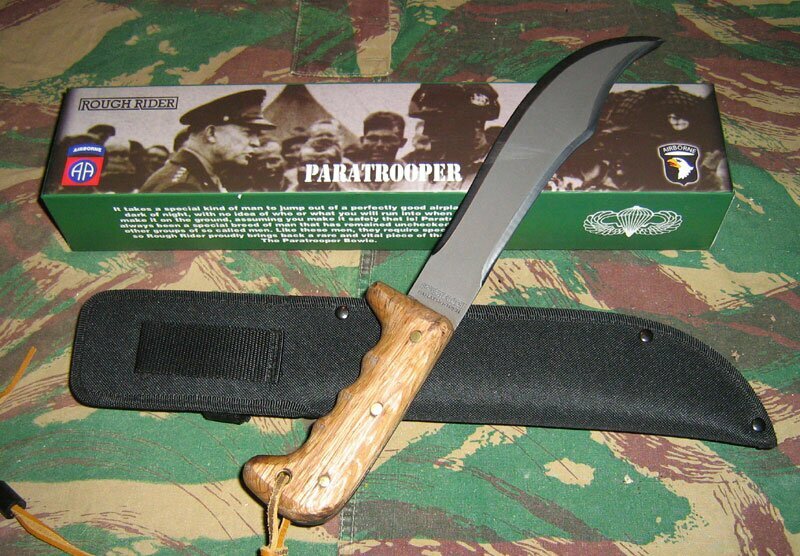 I’ve always wanted an Ek Paratrooper knife but the price tag is way out of my league. The next best thing would’ve been a replica. But, again, no one makes a reasonably priced replica either. That is, no one except Rough Rider. While I like Rough Riders and often sing their praises, I waffled a long time before I finally broke down and bought their Model 8. Two reasons held me back. First was Ek’s motto during WWII: “Made in America, by Americans, for Americans.” It pains me somewhat that this very patriotic American’s knife was not made in America. The second problem was the use of 440A stainless for the blade instead of 4340 Ni-Cr-Mo-Steel. Despite these misgivings, I finally broke down and bought the knife because it is the only Model 8 in town that I can afford or even find. After all, I assumed the most this knife is every going to have to take on is a rogue watermelon or possibly a post apocalyptic Nazi Zombie. As it turned out my second worry was unfounded. Rough Rider has this knife made in El Salvador at the same factory that makes the Marbles machetes. This is also the factory that produces knives for Condor Knife & Tool. The steel used in the knife is 1075 carbon steel. 1075 steel is a quality steel often used in hacking type knives because it is less brittle than the better known 1095 steel. While it does not hold an edge as readily as 1095, it is easier to sharpen and can take a beating. The spine is one long false edge. I'm not 100% sure but I think this was the case on the original. I've never heard of it be double edged. In all, the entire knife is a fairly accurate reproduction of the original Ek Model 8. Its biggest problem is the brass rivets. The original lead filled rivets were somewhat large. The brass rivets are much smaller. Otherwise, the blade profile and the handle accurately portray the original. Of course the original didn't have a lanyard hole but this is also minor. To make it more accurate you could fill the lanyard hole with wood putty or just consider it a field modification and deal with it. The knife blade is clearly and deeply stamped “Made in El Salvador” making it extremely difficult for a person to sand it out and re-stamp it with original Ek markings. I’m glad Rough Rider decided to this to reduce the chances of counterfeiting. The blade is not extremely sharp but it because of its enormous size it easily hacked a heavy card board box to pieces with no effort whatsoever. With a little sharpening the knife could easily take apart a side of beef or a Nazi Zombie. All in all I’m very pleased with this historic replica. The sheath that comes with the knife is very good. It is made of ballistic nylon and fits the knife quite well. A minor problem is the belt loop on the back. It will not fit around a standard web belt. I want a larger loop on my sheaths. Another small problem is the strap used to secure the knife in the sheath. It closes with a Velcro closure around the middle of the handle. As with so many closures of this type, the knife catches on it when you pull it out or try put it back in. This is exactly why the original sheath was a simple leather sheath with no tie down; Ek wanted to make sure nothing prevented the paratrooper from smoothly removing the knife. It'll snag almost every time on the securing strap. Even before the knife arrived, I had decided I was going to make a “theater sheath” for the knife; that is a homemade sheath a paratrooper might have made in the combat zone. Troopers did this because the other sheath fell apart or simply because they wanted a different style sheath. From the beginning I wanted to make one that would hang from the web belt using the classic hook system, and also one that would be made of heavy canvas something in plentiful supply.. The idea being the soldier would have made it from a shelter half or an old pack. In fact I ended up making mine from an old map case that was no longer useful. The sheath was made so that the knife could be hung from the left or right side and drawn left or right handed. (I’m left handed; I wanted a left handed sheath). The knife's lanyard is used to secure it in the sheath by threading it through the d-ring on the front. If the lanyards is not secured to the d-ring, the knife only gravity will keep the knife in the sheath. The belt hook at the top of the sheath is the most expensive part. I had to but two for $4.50! The two d-rings were part of the old pack I cut up to make the sheath. Close up of lanyard and the sheath d-ring used to secure the knife in the sheath. If the lanyard is not passed thru the d ring and then secured by the black slide it is free to bring into action. The lanyard is made from a raw hide shoe lace. The adjustable plastic sleeve is scrap from a worn out whistle lanyard. All in all, the knife is terrific, especially for a mere $20. Of course nothing is a good as the original but few of us will ever touch an original let alone own one! With a period replica sheath or a theater sheath similar to mine, it would be a perfect addition for anyone who does WWII reenactments and with the supplied sheath you’re already ready for the Nazi Zombie Apocalypse. And if that isn’t enough, it would also come in handy as a light duty camp knife. Rough Rider has done John Ek’s Model 8 Paratrooper proud. Sheath: Ballistic nylon, with pouch for sharpening stone (included) Velcro closures. Knife with a replacement "WWII Theater" sheath.